Audi will be the IOC's official automobile supplier through to 2016 under the agreement, initially equipping the organization with at least forty cars at the committee's headquarters in Lousanne and will provide vehicles at international IOC events as well. Plans for further joint projects, including corporate responsibility ventures, are included in the suppliership agreement's scope. Audi's parent company, the Volkswagen Group, has supported the Olympics on several levels throughout the years, including being the official vehicle partner for the Beijing Olympic Games in 2008 and will re-assume that role in 2014 at Sochi. 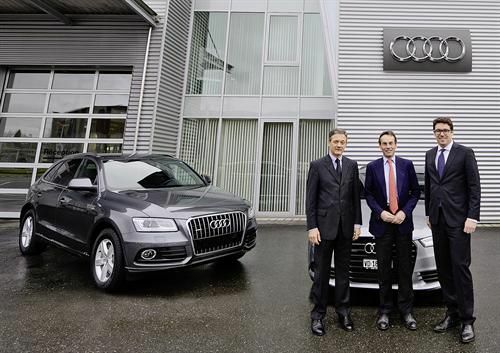 Audi has also been partnered with the National Olympic Commitees of Germany, Finland, Russia and Switzerland. Audi plans to leverage this new agreement to create a close brand identity with international sport and the spirit of brotherhood that the Games create for the world. "We're going to shape many exciting joint projects in the future," says Luca de Meo, member of the Board of Management for AUDI AG for Marketing and Sales. The agreement commenced on January 1, 2013 with a renewable agreement being in effect until December 31, 2016. Models to be provided come from the company's entire range, from the A1 to the A8L. Featured will be the Audi Q5 hybrid and A8 hybrid models. The first major event for which Audi will supply vehicles internationally will be the September IOC session in Buenos Aires. Audi is also partnered with other sports organizations such as the Federation Internationale de Ski (FIS) and fifteen national alpine teams. Collaboration with the Olympics will include socio-political ideas in connection with all major sporting associations and in keeping with the trend of recent Games events, corporate responsibility will take center stage. Audi has won several awards for environmental responsibility and social programs, including the coveted Green Car of the Year in Los Angeles in 2010 for the A3 TDI.